The beginnings of the Dromader plane development. In 1955. In PZL-Mielec, a team has created that brings together several constructors, which has turned into a design office. This office has taken the name Center of Aviation Structures. The employees of the office were graduates of the aviation faculties of the Warsaw University of Technology and Wrocław University of Technology. The constructors initially dealt with the construction of metal gliders. At the head of the team was the engineer Zdzisław Żok. At the beginning of the 60's, the office began working on the first agricultural plane project. The initial order was received from the GDR. Although there were no detailed WTTs, there were certain assumptions. One of them was the limited spread of the wing aircraft to 15 m, regardless of the size and weight of the aircraft. This was due to the size of the field hangars used in the GDR. Work on this plane has been stopped. Constructors were directed to work on the Lim-6 attack aircraft. After finishing work on the Lim-6 attack aircraft program, the constructors returned to work on the agricultural plane. In the first stage, a whole series of initial aircraft designs was created in a variety of layouts, sizes and weights. The construction of the aircraft of the engineer Alfred Baron passed into the preliminary stage. The aircraft was to be powered by two AI-14 engines, hung under the wings. High-wing guns. Airplane system: a chemical tank behind the pilot's cabin. Three-link chassis with front wheel. The aircraft was called PZL M-12 A. However, at the stage of building the cockpit model and developing the documentation, the work was stopped (around 1965). The reason was the unfavorable attitude of the CCCP government to the development of the aviation industry in Poland. In 60 years in the world, a new concept for the layout of an agricultural plane was created. In the USA, a new layout of an agricultural plane was developed: a motor - a chemical tank - a pilot's cabin. This system was dictated by the analysis of accidents. A pilot sitting between the engine and a large, heavy tank of chemicals, in the event of an accident, was more likely to suffer injury or death. When the pilot is sitting in the back, he has a huge crumple zone in front of him. In 1969, the Experimental Department was established in WSK PZL Mielec. The task of the new facility was to conduct research and development works: starting from projects, through technologies, building models and prototypes, to implementation and modernization works. The plant was commissioned to work on an agricultural plane for CCCP. 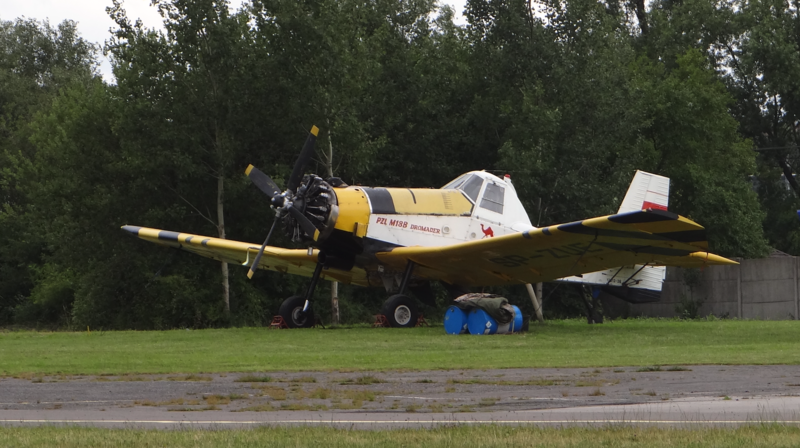 A new plane in forest management and agriculture was to replace the An-2 R planes. PZL WSK Mielec began cooperation with the Warsaw Institute of Aviation. At the head of the team stood engineer Adam Bobrowski. The chief representative of the Institute of Aviation was engineer Andrzej Frydrychewicz. The new aircraft was called PZL M-14. The preliminary project was completed in December 1970 and the technical documentation of the prototype was started. Introduction of the aircraft for serial production was dependent on the assessment and position of the future user, or CCCP. The M-14 plane was to be a low-wing plane with braces. The airplane system is: engine, chemical tank, crew cabin. Three-link chassis with front wheel. As a powered, a 920 kW (1,250 hp) GTD-10A turboprop engine was provided. The maximum take-off weight was to be 5,200 kg, a chemical tank for 2,200 kg, a surface area of 52 m2. Conversations with CCCP were difficult and strange. They themselves pointed out that the GTD-10A engine is unfinished. However, they did not want another drive (!?). Unexpectedly, as an illusionist pulls a rabbit out of a cylinder, CCCP proposed to Poland the construction of a completely different agricultural plane, which was developed by the engineering team of Remyra Izmaiłowa from Arseniewo. In the spring of 1971, several rounds of talks held in Moscow took place. Since CCCP was to be the main recipient of aircraft constructed at WSK PZL Mielec, the Polish side had little to say. The surprise was caused by the drive consisting of one turbojet engine, AI-25 used to drive Yak-40 airplanes. It was established that the aircraft will be refined by a joint Polish-CCCP team. The Polish side agreed to these conditions and the plane materialized in the form of M-15 Belfegor. (The M-15 Belfegor airplane is described in another part). Of course, the program of the M-14 aircraft was closed. Many Polish engineers who have not seen the future of the M-15 plane outside the CCCP. Therefore, they slowly, but with consistency, developed preliminary designs for a new aircraft that would suit users in Poland and in highly developed countries. The situation around the An-2 R aircraft was the motivation for the development of a new agricultural plane. During 26 years of production in Poland, about 7,200 copies were made in the An-2 R version. Almost all went to the RWPG countries, the so-called first payment area, where he ruled fictive transfer ruble. To the so-called second payment area, where US dollars or other hard exchangeable currencies were paid, only 64 An-2 aircraft were delivered, and if you exported to Yugoslavia, it was only 13 copies. Poles saw a great demand for this type of aircraft, produced in Poland, which competed on price (due to low paid Polish workers), and these aircraft would not be inferior to Western constructions, mainly from the USA. The mid-seventies of the twentieth century is a period of partial relaxation on the East-West line. The climax was the joint space flight Soyuz-Apollo. Using this, in 1974, the American company Rockwell International, producing, among other things, agricultural aircraft, was looking for a partner for a joint business. The partner should have high-power aircraft engines and the ability to design and build aircraft. Both companies, Rockwell International and WSK PZL Mielec have established cooperation. The Rockwell International company was a huge company whose origins date back to 1928. The company operated in the automotive, printing, electronic and many other industries. In September 1967, the company took over the well-known North American air company and created North American Rockwell. The company has become the main supplier of avionics. In 1973, Rockwell International was formed from various transformations. 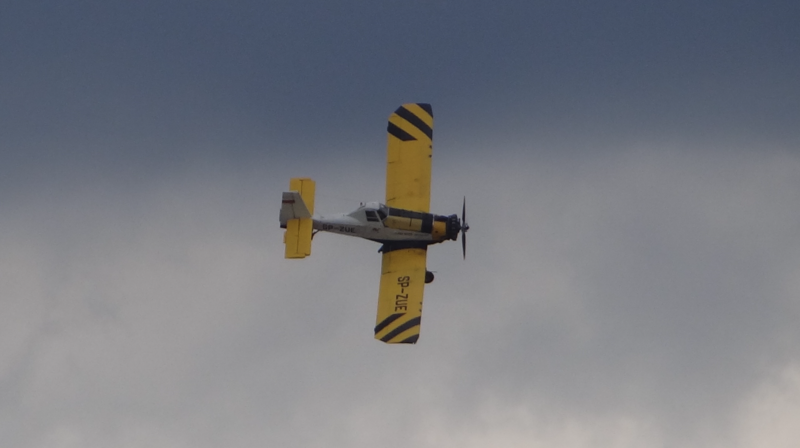 The company also took up the construction of agricultural aircraft. However, in 1979 part of the company was sold. The most famous aircraft of the company of this period is the B-1 bomber aircraft. In August 1974, the pilot of the experimental engineer, Andrzej Pamuła, was sent to the USA (Alabama) to become acquainted with the S-2R Thrush Commander aircraft produced there. The S-2R Thrush Commander made its first flight in 1956. This plane was powered by a Pratt & Whitney engine from a demobil. 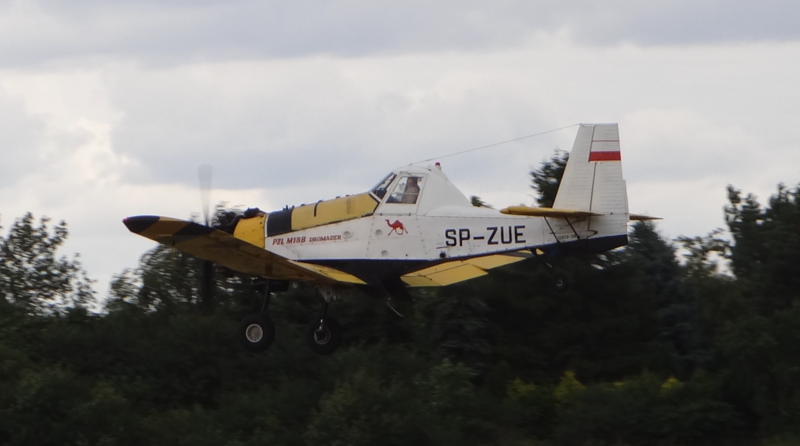 In autumn of 1974, at WSK PZL Mielec, work began on a new agricultural plane powered by a piston engine ASz-62 Rm18, with a power of 736 kW (1,000 HP). This engine was produced in Poland for the PZL An-2 aircraft. The engineers planned to use some technical solutions from the S-2R Thrush aircraft in a new airplane. It is not true that the M-18 Dromader aircraft is a licensed version of the S-2R Thrush Commander aircraft. The WSK PZL Mielec plant has never bought the license rights. However, it is true that some solutions from the American aircraft were used in Polish construction. Only fragments (structure) of the fuselage and wings construction were used from this machine. It resulted from the signed agreement between WSK PZL Mielec and Rockwell International. Polish engineers, with boss the direction of master engineer Józef Oleksiak, decided that on the basis of the ASz-62 engine, you can build an airplane 40% heavier than the S-2R Thrush aircraft. The preliminary project was completed in January 1975. On February 27, 1975, a cooperation agreement with Rockwell International was signed in Krakow. The agreement was about launching the PZL M-18 aircraft construction program. Construction documentation was prepared in July 1975. In September 1975, the tooling for production was ready. It should be emphasized that the technical project was carried out in record time; from February 1975 to July 1975. Using several components from the S-2R aircraft, it was possible to shorten the assembly of prototypes to about one year. Three prototypes were built. One for static tests and two for flight tests. The PZL M-18 aircraft was built in the same way as another Polish PZL-106 Kruk plane, which is the safest and most convenient in operation. The aircraft has a starting weight of 4,200 kg with a tank for 1,200 kg of chemicals. The overloaded version of the aircraft has: a starting weight of 4,700 kg with a tank for 1,600 kg of chemicals. The PZL M-18 plane is named after the crew's cabin, which protrudes above the fuselage, thus resembling a one-camel - Dromader. 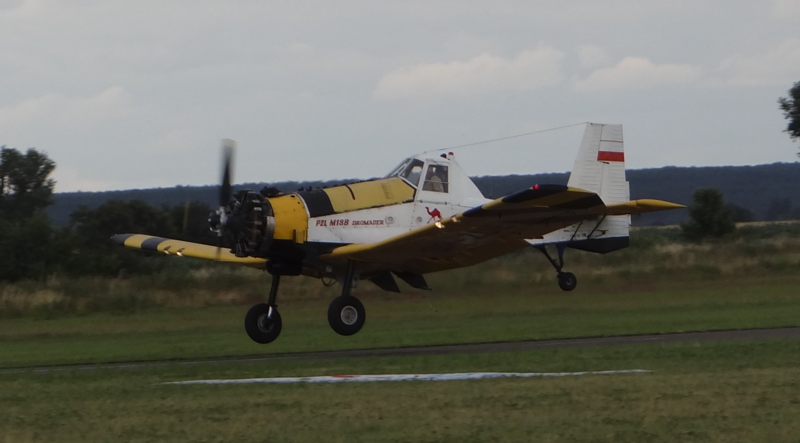 On August 27, 1976 at Jasionka Airport (at the time belonging to the Rzeszów Aeroclub), the first flight of PZL M-18 Dromader No. 1ZP 01-02 took place, registration of SP-PBW. The pilot was engineer Andrzej Pamuła. This success was an opportunity for the ceremony among the crew of the Experimental Department and the entire PZL Mielec plant. The second prototype PZL M-18 No. 1ZP-01-03 registration SP-PBZ made the first flight on October 2, 1976. The pilot was engineer Tadeusz Gołębiewski. The third prototype No. 1ZP-01-01 made various static tests and functional tests. During this period, numerous Polish institutions and plants participated in the implementation of the program: Institute of Aviation in Warsaw, Rzeszów University of Technology, Air Force Institute of Technology, Institute of Fundamental Technological Research, Polish Academy of Sciences, Science and Production Center of Light Airplanes in Warsaw, WSK PZL-Kalisz, WSK PZL Hydral in Wrocław, PZL-Bielsko, PZL-Okęcie Warszawa, Huta Baildon in Katowice, Huta in Sosnowiec, Walcownia Metali Lekkich in Kęty, the University of Agriculture and Technology in Olsztyn and Rockwell International (USA). Most flight tests were carried out at Mielec Airport in autumn and winter 1976. In 1978, three planes were sent to Egypt, where they participated in the cotton crop protection campaign. Pilot properties and aircraft performance were better than expected. The information, photos and film from the PZL M-18 trials were presented in December 1976 at the agricultural aircraft exhibition in Las Vegas (USA). In the summer of 1977, the PZL M-18 aircraft was shown at the International Air Show in Paris. The program was stopped for six months, due to a prototype accident No. 1ZP01-02. Experimental pilot engineer Tadeusz Gołębiewski rescued himself with a parachute jump. At that time, a flight was made to test the torsional stiffness of the horizontal tail, which curled during the flight in the slip. The accident test showed too weak a tail structure. After the cause was detected, the structure was improved and flight tests completed. It was the only lost plane. In September 1978, factory and state tests were completed and the aircraft received a type certificate (No. BB-120 September 1978), issued by the Polish Ministry of Communications. Around 1978, events took place that had a significant impact on the further development of the PZL M-18 aircraft. Rockwell International withdrew from cooperation due to the fact that it was not allowed to produce agricultural aircraft. The plant and the rights to agricultural aircraft (including M-18) were sold to Ayces (Aces). Ayces did not cooperate with WSK PZL Mielec. However, in Poland, it was decided to continue the M-18 program with its own strength. The program still had ministerial support and lack of funding, it did not threaten it. In the current situation, it was necessary to finish the tests that were not carried out in the USA. Polish institutions have become more involved in the program. The Institute of Aviation in Warsaw performed: tunnel tests, resonance tests, aerodynamic documentation, undercarriage tests. The Institute of Aviation of the Rzeszów University of Technology performed: documentation of aircraft loads, strength calculations of the main airplane assemblies, elastooptic studies of the main wing nodes. The University of Agriculture and Technology in Olsztyn ran spraying and spraying tests. PZL Kalisz has prepared the engine version marked ASz-62 IRm18 especially for M-18. PZL Hydral from Wrocław developed and produced a hydraulic installation. PZL Bielsko Biała has developed and built a container for chemicals made of plastic (laminate). Huta Baildon and Huta M. Buczka in Sosnowiec developed a new chromium-molybdate steel and produced semi-finished products from it. The plant in Kęty produced profiles of light alloys. The program entered the most difficult period. WSK PZL Mielec had to find buyers and collect orders from them. Only the appropriate number of orders guaranteed the return of incurred expenditures, profit and success of the program. Therefore, it was decided to build an information series of 7 aircraft. This series has been enlarged to 10 aircraft. By July 1978, 5 machines were built. In 1977 - December 1978, airplanes took part in exhibitions and air shows, namely: Paris Air Show, Hannover (Germania), Las Vegas (USA), Międzynarodowe Targi Poznańskie in Poznań (Poland), Bolzano (Italy), Budapest (Hungary), Belgrade (Yugoslavia), Baghdad (Iraq). At the end of 1978, WSK PZL Mielec applied for foreign certificates: French, Canadian and American. Until 1988, the plane received certificates such as: Polish, American, Canadian, French, Yugoslav, Germanic, Czechoslovak, Chinese. The serial production of the aircraft was launched in December 1978. In 1979, two planes were assembled. In the spring of 1982 a hundredth copy was built. In autumn 1983, a two-hundredth copy was built. By the end of 1987, 433 machines were built, including 13 prototypes and information (presentation) machines. 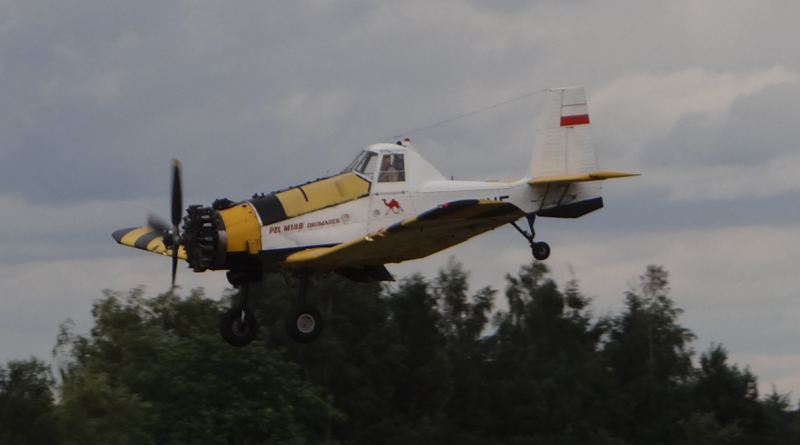 PZL M-18 Dromader is really an excellent agricultural, forestry and firefighting plane. The airplane with its characteristics exceeded all similar constructions. The aircraft is distinguished by a high speed of climb. On the grass airfields, it has a short take-off and landing path. The machine performs fast turns (20 seconds). It has moderate fuel consumption (140-150 liters / h). Replacing specialist equipment takes little time (15-60 minutes). The aircraft can work at night. It can perform remote ferrying (up to 2,500 km using a chemical tank as a fuel tank). Comparison of the M-18 with the popular An-2 R in Poland gives an even better picture of modernity. The An-2 consists of 12,000 parts, while the M-18 only has 5,000 parts. An-2 R takes 5,000-8,000 hours, and M-18 only 3,500-4,000 hours. M-18 is mainly produced from semi-finished products manufactured in Poland. Parts import is only 4% of the price of the entire aircraft. It was also said to reduce this indicator to 1%. The airplane was one of the best agricultural machinery in the world through technical solutions, performance and price. In 1980, it was expected that the aircraft would be competitive for 15-20 years. Today (2018) aircraft can still be competitive. Like no other Polish plane, PZL M-18 has been recognized in Poland and around the world. For the development of the M-18 the Experimental Department staff, Mielec received in 1980 a second-class state prize in the field of technology. The winning team is: Józef Olesiak main constructor, Adam Borowski Rzeszów University of Technology, Tadeusz Gołębiewski pilot, Wacław Kiepel, Kazimierz Kita, Wojciech Podkański, Jarosław Rumuszewicz, Wiesław Szczepański, Tadeusz Światowiec, Włodzimierz Stępień, Jerzy Stachnik, and Walenty Wróblewski. In 1979. Gold medal at the agricultural equipment exhibition in Novi Sad in Yugoslavia. In 1979. Medal at the International Technical Fair in Plovdiv, Bulgaria. In 1979. Medal at MTP in Poznań. In 1981. The title of Champion of Export at MTP in Poznań. In 1984. Medal at the Leipzig Trade Fair (GDR). The M-18 is also a great firefighter. We must remember that burning one hectare of a 30-year-old forest is a loss of 400,000 zlotys (1985). Extinguishing fires is done by dropping the so-called "water bomb". In the period from 1978 to 1983 tests for extinguishing fires by PZL M-18 were carried out in: Poland, France, Kanda, Greece, and Portugal. In 1983, tests were carried out in the USA. There, they were the most careful, and most importantly, at the same time comparable with fireplaces of other companies that were operated in the USA at that time. From 1983, further research was carried out on behalf of and in cooperation with the Forest Fire Protection Department of the Forest Research Institute. In Krzystkowice near Żagań a base of firefighting vehicles was created. Initially, the database was experimental. Soon, the Supreme State Forests Administration signed agreements with several companies for the construction of Forest Airbases. The first such base was established in May 1984, near Zielona Góra. In mid-1985 there were already 6 such bases. In these bases Wilga (as patrol) planes were used, PZL-106 Kruk and PZL M-18 Dromader. 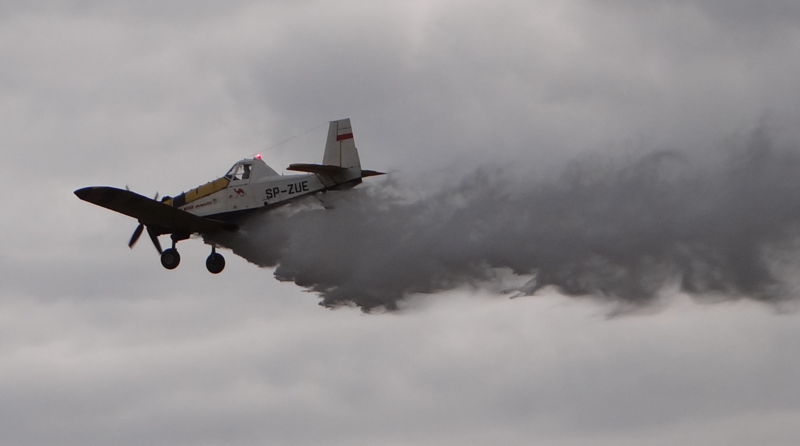 The M-18 aircraft takes 1 700 liters of water and 60 liters of detector (wetting or foaming agent), which increases the effectiveness of forest extinguishing. The bottom flap of the tank is 30 cm x 45 cm and it is pneumatically operated. Dropping the Dromeder water bomb from a height of 30 m takes about 2 seconds. The surface coverage is about 60 m in length and 25-30 m in width (1800 m2). PZL M-18 A version 1984 - A plane was obtained for a second additional crew member, usually a mechanic. It takes place during the ferrying of the aircraft. This is a solution borrowed from the PZL-106 Kruk airplane. Also, heating and filtering systems for air supplied to the crew's cabin were introduced. Up to 726 liters fuel tanks were enlarged. The control of the chemical system was changed to electro-hydraulic, which greatly facilitated the pilot's work (physical exertion). M-18 AS version with two controls. 1988 - A large number of M-18 aircraft users made it necessary to develop a two-pilot cabin. Such a plane was created at the end of 1987 and received the designation PZL M-18 AS. The first prototype was the aircraft M-18 AS No. 1Z 014-12, registration SP-PBO, made the first flight on March 21, 1988, the pilot was Henryk Bronowicki. During the exploitation of PZL-18 Dromader, it was noticed that potential customers are looking for slightly smaller machines, or vice versa, even larger ones. Therefore, based on unified components, it was decided to extend the offer with new versions of the aircraft. This is how the family of aircraft consisting of four types was created; Dromader Super, Dromader, Dromader Mini and Dromader Mikro. The engine with 441 kW (600 hp). The tank of 900 kg of chemicals. Works by plane in Mielec in the Experimental Department began in January 1980. Documentation was completed in June 1980. Two prototypes were built. The first flight was made on June 18, 1982. At the controls sat PZL pilot Mielec engineer Tadeusz Pakuła. The aircraft initially had a PZL-3 S engine, followed by PZL-3 SR (441 kW, 600 HP). Engines well known from the PZL-106 Kruk airplane. The second prototype was flown in March 1985, the plane passed tests in Poland and Yugoslavia (1986 - 1987). In June 1985, the aircraft received a temporary certificate (without corkscrew trials). The plane interested in such countries as; Nicaragua, Yugoslavia and Bulgaria. Basic data PZL M-21: dimensions span 14.51, length 9.48 m, height 3.82 m, bearing area 38.0 m2. The aircraft has a starting mass of 3,300 kg or a limited version of 3,600 kg. It takes 800-1 100 kg of chemicals. The plane has 70% of parts and components from the M-18 aircraft. 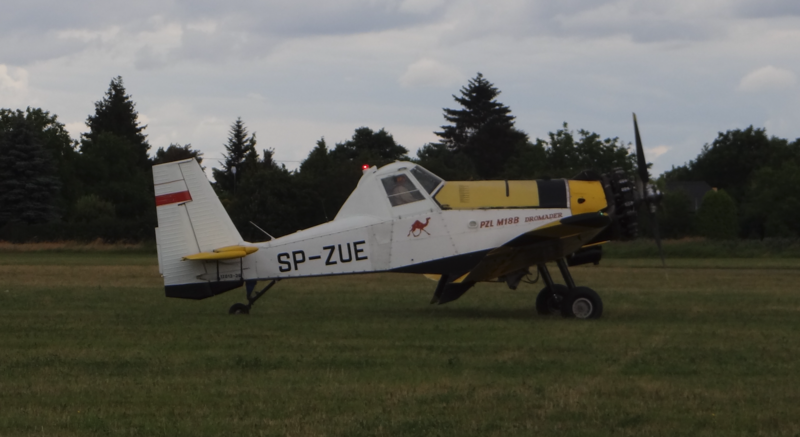 PZL M-24 Dromader Super. 1987. The engine with 920 kW (1,200 hp). The tank 1 600 kg of chemicals. Works on the aircraft began in 1981. The project was approved in June 1981 and the development of technical documentation began. The documentation was completed in mid-1982. Because the program was not a priority, its implementation took place as far as spare capacity was concerned. The prototype for static tests was submitted on January 20, 1987. The second prototype was ready in April 1987, and the third prototype in October 1987. In PZL Kalisz, an engine with increased power has been developed. It has been marked with the symbol K9. It is based on ASz-62. It has a power of 883 kW (1,200 hp). At the end of 1987, three copies of the engine were ready for assembly in airplanes. The aircraft received a chemical plant with an increased capacity of up to 40 liters / second. At Stomil in Poznań, new tires for the main chassis were developed. A new type of shock absorbers was also developed, so-called two-chamber shock absorbers. The light metal plant in Kęty has developed new profiles. The Military University of Technology joined the program by performing a large number of tests. Modelers from Krosno made a remotely controlled model of the aircraft, on which inter alia corkscrew attempts were made. The model was piloted by engineer Waldemar Peszke from Krosno. The first flight was made at Mielec Airport on July 14, 1987. The pilot of the pilot, Jerzy Pamuła, sat at the controls. The plane had then an ASz-62 replacement engine. Basic data PZL M-24 Dromader Super: dimensions span 19.90 m, length 10.80 m, height 3.80 m, supporting surface 45 m2. Chemical tank with a volume of 2,700 liters and a load capacity of 1 600-1 800 kg. Starting weight 5,000 kg, and in the limited version up to 5 300-5 500 kg. Capacity of 1 400 liter fuel tanks. Each aircraft can be equipped with second controls. 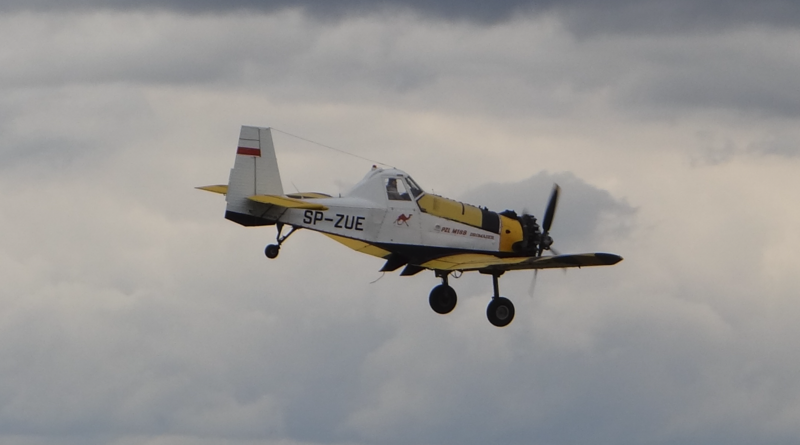 PZL M-25 Dromader Micro. The prototype of the aircraft was not built. The engine with 216 kW (280 hp). The tank of 500 kg of chemicals. The aircraft was to replace the already unproduced agricultural aircraft PZL-101 Gawron and Czechoslovak Z-37 Ćmielak. The initial design of the aircraft was completed in March 1983. In December 1987, technical documentation was completed. The aircraft was to be powered by a 216 kW (280 hp) AI-14 RDP engine. 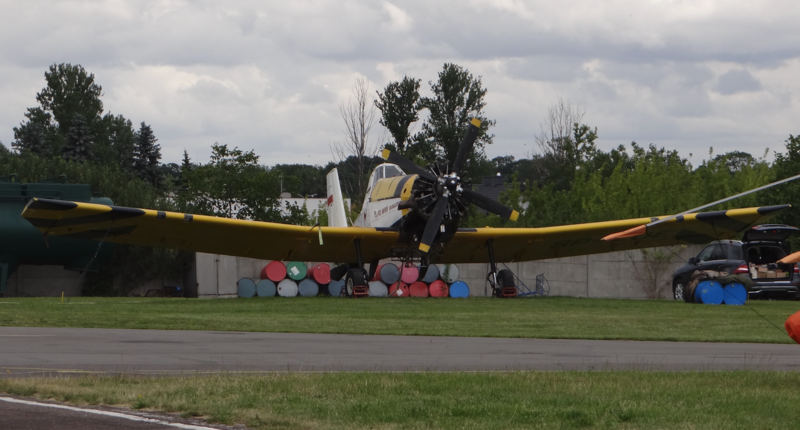 It is a well-known engine from PZL-101 Gawron and PZL-104 Wilga aircraft. The engine was built at PZL Kalisz. Basic data PZL M-25 Dromader Mikro: span dimensions 11.60 m, length 7.65 m, height 3.20 m, bearing area 17.2 m2. The aircraft has a tank for chemicals with a volume of 880 liters and a capacity of 500 kg. The take-off weight of the aircraft is 1 650 kg. The prototype was not built and the program was suspended. PZL M-30. A proposal for CCCP. In CCCP, planes PZL M-15 Belfegor suffered a total defeat. In kolkhozes, the planes were poorly exploited and in a short time they were grounded. Then the plane was devastated and stolen. The Polish side offered CCCP a simpler agricultural plane based on the M-18 Dromader design. In September 1984, talks between the Polish side and the civil aviation minister CCCP, companion B. Bugajew, took place in Warsaw. In November 1985, WSK PZL Mielec presented to the CCCP website a study of the aircraft marked PZL M-28. This designation has been changed to PZL M-30, not to be confused with the PZL An-28 transport aircraft. The project was developed in August 1986, and the WTT requirements defined as the RWPG Air Regulations were adopted as the basis. The lifting capacity of chemicals was determined at 2 400 kg. The take-off mass of the aircraft is 5,300 kg. As a drive, a TWD-20 turboprop engine with a capacity of 1 011 kW (1,375 hp) is provided. The design of the new aircraft was discussed in Moscow in January 1987. However, he did not get approval. The reason was 100% control of the Polish side over the new aircraft. However, it was agreed that a joint team of Mielec-Kiev constructors will be created. The OGK Kyiv office was to be the CCCP party. Because at that time, preparations were being made for the production of An-28 transport aircraft in Mielec, therefore the CCCP party was managing an agricultural plane on the basis of the An-28 R aircraft. Such an agricultural plane had no chance of success. The new PZL M-30 aircraft has never been made. In 1986, a meeting (symposium) of representatives of users, mainly from Eastern Europe, was organized to Mielec at the invitation of the WSK PZL-Mielec directorate. It was a very good move, which went well for everyone, and above all for the Dromader construction. It must be remembered that planes have been operated in countries where there are various provisions regarding avionics equipment, conditions applicable at landing fields, as well as climatic conditions. The effect was that planes for individual users are different. 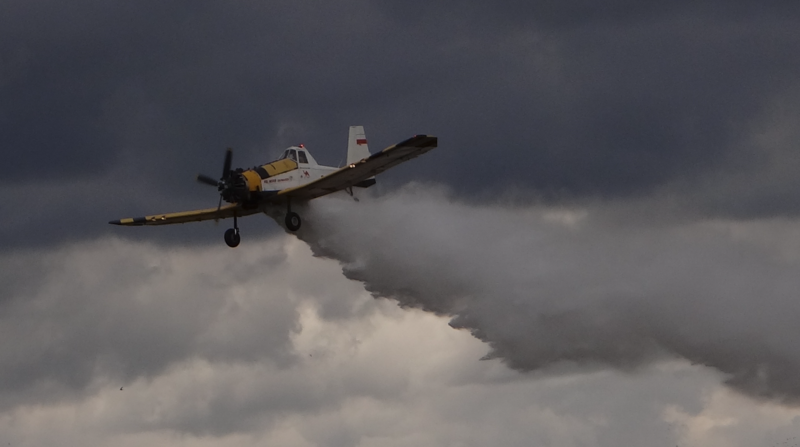 PZL M-18 Dromaders in Cuba worked at high temperatures and high humidity. 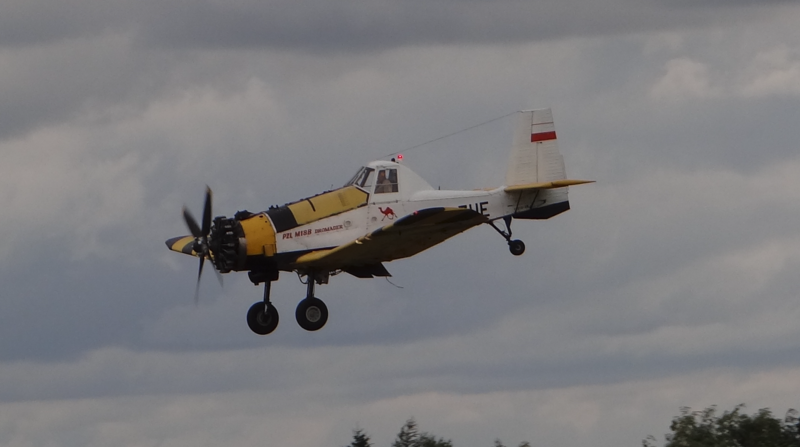 PZL M-18 Dromaders in the GDR started flights already in February, with negative temperatures. Their planes had covers for engines. Installation performance is also different. In some countries, the standards of 100 chemical particles per one square meter were in force, and in the GDR, 200 particles per one square meter. Airplanes exported to the GDR received an additional anti-corrosion coating. PZL M-18 Dromoaders for Yugoslavia - some airframe elements were made of stainless steel (eg tail wheel hub and rear hull cover). Some users, such as Kuba, used over 32 aircraft at that time. However, they bought them in small batches, 2-5 machines each. That's why planes have differences between them. For example, all hydraulic brake lines were rigid, and later flexible hoses began to be introduced. Therefore, their first copies had to be gradually changed to the latest varieties. Bulgarians during the Mielec Symposium signaled an unknown problem of gas lever fractures. Because the gas lever is located at the entrance to the cabin, it has been found that it is possible to hook it, which can lead to bending. This element has been strengthened. 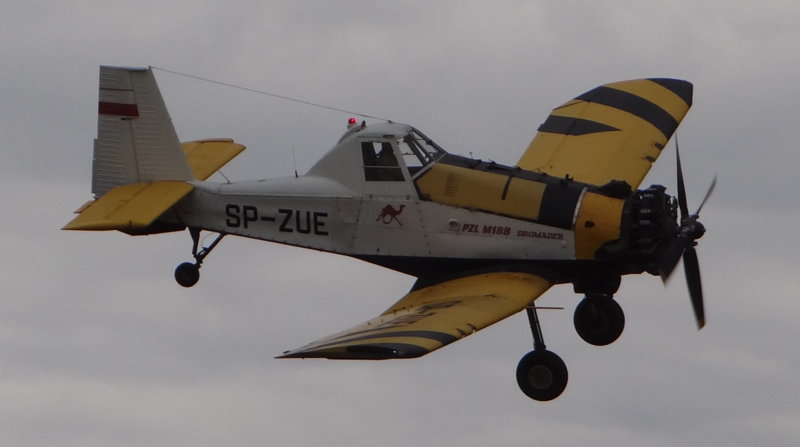 Bulgarians belonged to one of the first users, so they exploited PZL M-18 Dromaders the longest and very intensely. As a result of the meeting, some users have requested changes that they learned from others. Until 1986, the WSK PZL Mielec factory built over 320 M-18 Dromader aircraft. These aircraft were used in 17 countries. The annual production of Dromader aircraft was 50 units. 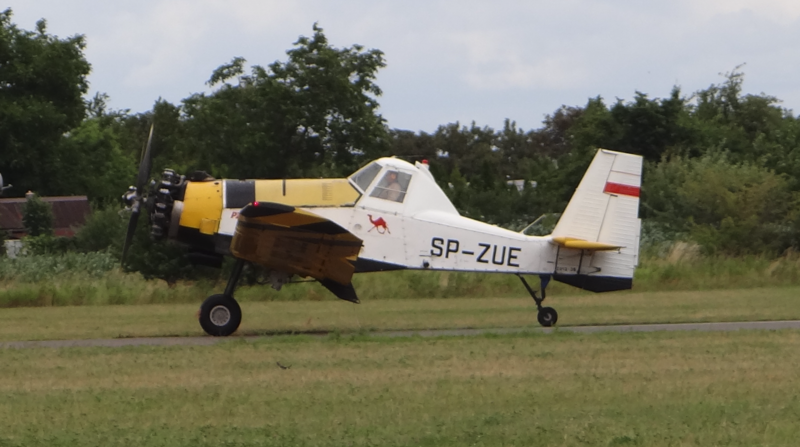 In PZL Okęcie in Warsaw, agricultural planes PZL-106 Kruk were built. In total around 100 agricultural aircraft were produced annually. Now we can see what a giant in this aviation segment was Poland. In 1988, M-18 Dromader aircraft were operated in 17 countries around the world. In subsequent years, this number increased to 24 countries (2000). Since the aircraft is still in the factory's offer, this number is not final. In 2000, more than 200 M-18 Dromader aircraft were operated in the USA. By 2010, 759 aircraft were built. In Poland, the most-known mass use of Dromaders (22 planes in action) took place during the forest fire fighting near Kuźnia Raciborska on August 26, 1992. Currently (2018) versions of the M-18 B and M-18 BS aircraft are offered by Sikorsky PZL-Mielec. M-18 / T45 Dromader Turbine 1986. M-18 / T45 Dromader Turbine - version with turbocharged Pratt & Whitney Canada PT6A-45 engine. The first flight took place in 1985. and received the FAA certificate in April 1986. M-18 B - modified version M-18 A with increased capacity. In production since 1993. M-18 BS - school version (for two pilots). 1994. M-18 C - version with a more powerful Kalisz K-9 engine with a power of 895 kW (1200 hp). Developed in 1995. AII AVA-303 - version built in Iran as AVA-303. Model M18 BS - school version (for two pilots) - crew: pilot-instructor + student + 700 kG cargo.